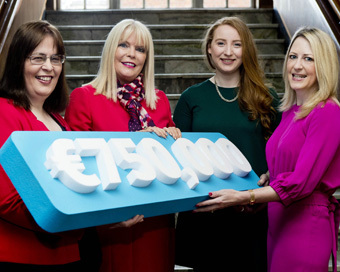 Enterprise Ireland’s €750,000 Competitive Start Fund (CSF) for Female Entrepreneurs will open for applications on Wednesday 3rd May. Up to €50,000 in equity funding is available to a maximum of 15 successful female applicants with early stage start-up companies. Last year, one in three companies who received CSF investment from Enterprise Ireland were female-led. As well as securing up to €50k in funding, 10 of the successful applicants will also have the opportunity to participate in Dublin BIC’s INNOVATE accelerator programme. Delivered over a 12-week period in the Guinness Enterprise Centre, the interactive INNOVATE programme will increase the capabilities of the participants and move them to investor-ready within a short period. The purpose of this CSF is to accelerate the growth of female-led start-up companies that have the potential to employ more than 10 people and achieve €1 million in export sales within three years. The fund is designed to enable those companies reach key commercial and technical milestones which will ensure delivery of their product or service to an international audience. Minister for Jobs, Enterprise and Innovation, Mary Mitchell O’Connor TD said: ”Enterprise Ireland’s dedicated Competitive Start Fund for Female Entrepreneurs was put in place five years ago to encourage more women to start businesses and to provide a launch platform for business women in the Manufacturing and Internationally Traded Services sectors. Last year, 34% of CSF recipients were female entrepreneurs and this new €750,000 fund for 2017 will provide valuable and practical support for the next generation of female-led companies with global ambition to compete in export markets”. Sarita Johnston, Female Entrepreneurship Manager, Enterprise Ireland added: “Working with ambitious start-ups led by women is a key focus for Enterprise Ireland and the purpose of the CSF is to accelerate the growth of start-up companies that have the capability to become High Potential Start-Up (HPSU) companies. We have seen a major leap in female-led early-stage companies since the commencement of our initiatives in 2012 – from 7% of HPSUs to 20% in 2016. “Enterprise Ireland is delighted to partner with Dublin BIC on their INNOVATE programme this year. It’s a unique opportunity for ambitious female founders to receive investment from Enterprise Ireland and to participate, in parallel, on the INNOVATE programme to get their businesses investor-ready”. The Competitive Start Fund for Female Entrepreneurs will close for submissions at 3pm on Wednesday 17 May. Image: L-R: Liz Fulham, Sales Optimize; Minister Mary Mitchell O’Connor TD; Rhona Togher, Restored Hearing and Sarita Johnston, Enterprise Ireland. Photo Fennell Photography.